This huge bouquet of gorgeous mixed Tulips will melt anyone's heart. It would make a stunning centrepiece in any room and is a great present for Mother's Day. 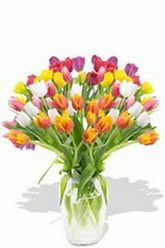 The special someone that receives this overwhelming bouquet of Tulips is a very special someone indeed.The vase in the picture is not included, but to personalise your gift, you can order a vase to be sent with your order. Choose between 3 vases; Standard, Premium and Superior. We recommend the Premium Vase for this bouquet. EVERYTHING WAS EXECUTED PROFESSIONALLY AND PROPERLY ARRIVING APPARENTLY LOOKING BEAUTIFUL,ACCORDING TO MY DAUGHTER WHO WAS THE RECIPIENT.THANK YOU. Easy and efficient! My friend who received the flowers was very happy with the bouquet.